Of the six masses recovered, the Attakuruki stone is best documented in the public media. It was the most spectacular impact site and drew the most attention from the news teams. The stone hit the tar road in Attakuruki at 0830 hours, some 500 meters from the National Road N°7. This particular fall was witnessed by at least three villagers, one of them as close as 50 meters from the impact. Three cows tied to a pole in front of a house were even closer, about 6 meters from the crater. The crater itself was nearly circular, 4 feet wide (1.20m) with a roughly circular ring of debris radiating from it. Fragments of the tar surface were found on rooftops as far as 30 meters away. When the crater was first examined by the villagers it was found to be funnel shaped and narrowing to less than 40 cm at half depth. It was 0.8 meters deep but part of the walls had slid to the bottom and after this was removed the crater was measured to be 1.0 meters deep. Frgaments of the meteorite had penetrated the ground to a depth of 1.10 meters. 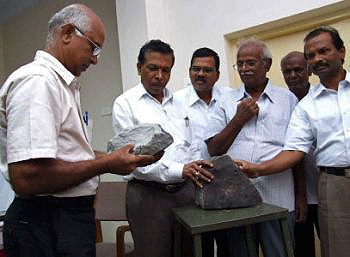 As Krishnagiri District Revenue Officer, N. Nagarajan arrived at the scene he had already been informed by the Geological Survey of India via fax, that the possibility of a meteorite fall must be taken into consideration. This did not convince the followers of the “bomb theory” but it helped to get people to collect fragments of a bright friable rock that was shattered in and around the crater. According to eye witnesses a total of ~30kg of fragments were collected from the site and later handed over to a combined investigation team of the Geological Survey of India (GSI) and the Forensic Science Laboratory, Chennai. Although some of the smaller fragments escaped collecting, district revenue officers secured most of what was left of the mass from the crater. According to newsmedia reports a total combined weight of 50kg was collected. Most probably this figure refers to material retrieved from 4 impact sites known when the reports were issued (Sept. 14). The fragments the officials collected from the crater appeared to stem from a rather compact shaped mass. The diameter of the impacting meteorite may not have been more than 35-40 cm. Obviously this was sufficient to create a funnel shaped impact pit 1.20 m wide and 1.0 m deep in the compressed dry ground of the village road. On September 14 the impact site in Attakuriki was again visited by a group of journalists and the friendly villagers offered to them to re-excavate the crater, which had meanwhile been filled, in order to document it. A number of small fragments were found on this occasion, the largest was an almond shaped piece of 100g. As several splashes from the rice paddy indicated it is probable that fragments of this particular mass buried itself in the muddy field. 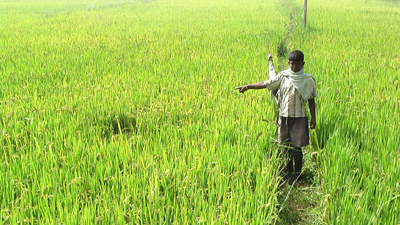 The two eye witnesses did not succeed in recovering pieces from the paddy. Later that day one meteorite fragment of 36g and several in the 10g range were found opposite the palm tree at the other side of the track and around the foot of the palm. The damage of the tree was documented in photo and video on September 14. Two dry branches of 14cm were cleanly sheared off the palm tree several others broken. 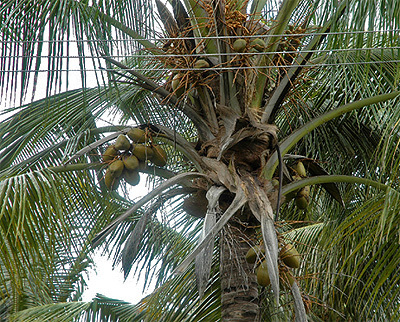 At least one coconut was severed by the meteorite and subsequently found in the paddy. No information could be obtained whether the GSI had visited this particular location. According to eye witnesses the total recovered from this site was ~6kg. Roughly 100m southeast from the coconut impact a third mass fell into another flooded rice paddy, producing an impressive fountain of mud and water that rose vertically in the air. A farmer working a paddy nearby with a cow witnessed the impact. On investigating he found a 50 cm wide hole in the ground below the surface of the muddy water. This gentleman later reported a helicopter like sound that appeared shortly before the big splash. The investigation team has visited the site but no information could be obtained by our correspondent whether specimens were recovered from the impact pit. This site was documented in video and photo two days after the event on September 14 by our correspondent. A. Malles, a boy of 14, was walking in a field parallel to the Kothur-Kammandadody village road as the air suddenly filled with an enormous thundering noise. As he looked up he saw several incoming trails of smoke with “rocket like speed”. At the same instant he noticed a plume of dust where a heavy object had impacted with a loud thud. He walked over to the spot and found a black stone, the size of a mango, that had penetrated into the dry ground only two or three centimeters (see image on page one). According to locals this mass of ~1kg was later handed over to a district revenue officer. Approx. 500 meters southeast of Kothur, in the village of Routhapalli a fifth mass impacted on dry ground at the bank of a dirt track and barely missed a single house by 15 meters. A. Sakunthala, 40, was just about to enter the door of her house as she saw the stone hit and eject a spray of dirt and rocks from the ground. She later reported she heard a deafening explosion an instant before the impact which left her numb. This lady described the incident as “absolutely terrifying”. This impact was also witnessed by G. Srinivasan, a boy of 14. This mass was excavated on the day of the fall. The impact pit was destroyed in the process and it was later filled. According to eye witnesses who inspected the impact pit it was half a meter deep and wide. No information on weight, shape and characteristics of the mass recovered from this site could be obtained. Several witnesses explained it was handed over to the investigation team. 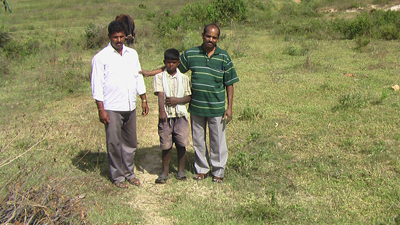 The meadow site is located half way between Routhapalli and Gangapuram near the hamlet of Bharathipuram. The impact was witnessed by Mr.Duraisamy, 70 and his wife and by Mrs.Kandhamma. 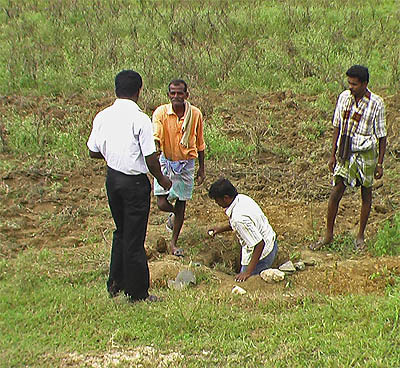 The site was visited in the afternoon by a TV news crew which also filmed the impact pit and the meteorite Mr. Duraisamy had recovered from it. For this purpose it was placed in the pit it had caused. The angular pyramid shaped mass of ~20kg was dug out from a depth of 0.8m. Its was undamaged apart from a few chipped corners, fully coated with a dull black fusion rind. On the side facing forward on impact it displayed shallow regmaglypts. The specimen was later collected by officials and brought to the district office at Hosur. 1 km from Routhapalli near Gangapuram, another mass of unknown weight impacted six meters from the house of the Muniyappa and Venketash family. This impact was also witnessed by G. Ellappa and A. Srinivasan. The fate of this meteorite, which was recovered shortly after the fall, is unknown. As the Hosur area had received a lot of rain in the previous months, most of the reservoirs and lakes in the area were filled up to their maximum capacity. A small lake half way between Attakurukki and Routhoupalli had a water level of approx 1.25 meters at the time of the fall. Mr. A. Subramani, 35, walked in the direction of Attakuriki as he heard a growing thunder coming from the north. As he turned to look an object hit the surface of the lake with a deafening clash and ejected a collumn of mud and water 50 feet high. No attempts have been made to recover this particular mass. 8 impact sites are known at present. They form an strewn field with a diameter of less than 1.9 km. The reported combined TKW collected at all sites at present is given with 50-60kg according to media reports and locals, however, the GSI later reported a TKW of 110 kg. At the time of this Report, at least two masses that were seen impacting had not been recovered due to terrain conditions (3 and 8). 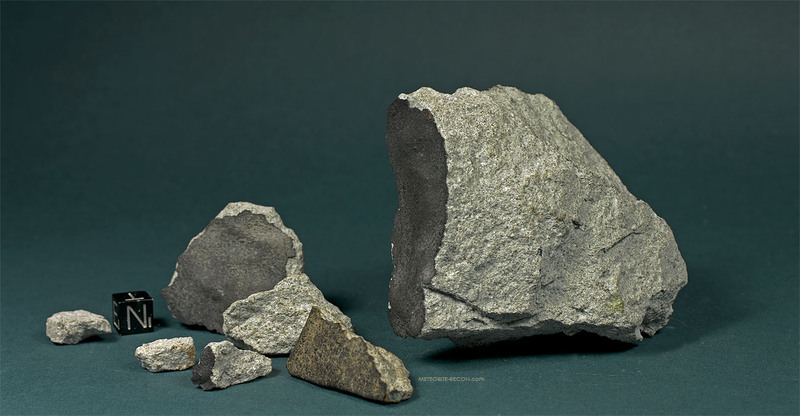 It is possible, that these meteorites were recovered later and added to the total yield. The strewn field map shown gives the respective impact sites with the numbers assigned as described above. The lines indicate the approximate flight paths, assuming medium winds from north-easterly direction at altitudes above 12,000 meters and little to no wind below. According to eye witnesses, the bolide first appeared at an azimuth of 280° and was heading in east-southeasternly direction with a bearing of 120°. (note that Initial reports indicating a north-easternly origin of the bolide were proven wrong). The mass distribution confirms the characteristic distribution pattern expected for a NW to SE trajectory. The largest known mass, which is the Attakuruki mass with ~30kg, has continued furthest downrange and landed at the easternmost end of the strewnfield. According to eye witnesses, the blazing fireball was seen up to a distance of at least 15 km east and northeast and up to a distance of 12 km south of the fall area. The bolide appeared at an azimuth of 280° -270° and was decending in a low angle with great speed. It lasted for 10-15 seconds. Detonations were heard in Hosur, which is 15 km west of Kammandadody and in Krishnagiri, which is 35 km southeast from the fall area.